Kleenex at the ready people because this is about a sad little girl watching The Chipmunk Adventure and i can guarantee it will evoke the most adorably adorable adorableness you have witnessed for a while and your eyes will most definitely betray all those repressed feelings you are so good at hiding. It doesn't matter how old you are, sometimes you can find yourself watching something that just pulls all those heartstrings at once. You can't help it, down roll the tears. Down they come, flowing. Like a river. And you don't care who's watching or if dad's videoing you in the back of the car to put on the internet later. Because a little baby penguin is lost and you're a sensitive soul and you just can't hold back those tears forever. Yep, this is The Chipmunk Adventure and it's a chin-quivering, tear-jerking blubberfest of a movie. Who knew? 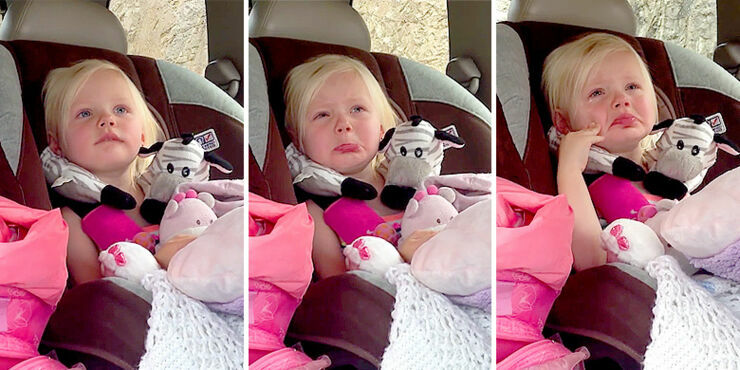 This little girl knew and watching her emotional response to it is a blubberfest all its own. Don't pretend you're not getting choked up yourself, because you are. Even dad's getting a bit weepy by the end. Damn those evil Chipettes and their singing. The adorable toddler’s father, cinematographer Travis Lupher captured the video and posted it to YouTube. He said of the event “When I noticed my young daughter getting emotionally absorbed in the cartoon she was watching, I set up a camera to record her.” Nice one dad. You have to wonder if Travis used his filming skills and knowledge to storyboard it and work out the scenes in his head as the event unfolded because you have to admit the video plays like a real Hollywood movie. Sad little girl image via Youtube. Sad Little Girl - Scene 1: "Going"
Sad Little Girl - Scene 1: ".......Going"
Sad Little Girl - Scene 1: "GONE!"